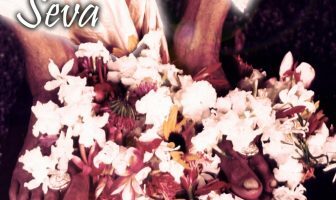 The following is a nice article, written by Smita Krsna Mataji, describing Kadamba Kanana Maharaja’s seminar regarding faith, held on the first and second of October in Govinda Valley, Australia. 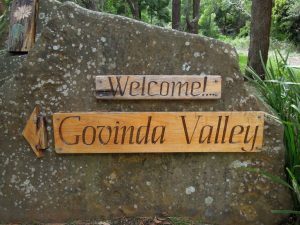 Kadamba Kanana Swami flew into the harbour city of Sydney, just in time for the scheduled retreat at beautiful Govinda Valley, which is situated one hour south of Sydney in the bushland of Otford. Maharaja opened the retreat with a kirtan on Friday night. 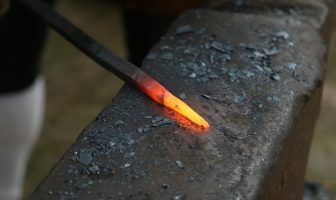 He charged the whole atmosphere with the spiritual sound vibration. After an hour of kirtan, Maharaja gave a welcome talk and an overview of the whole retreat. He emphasised that the taste for spiritual life can be developed by the service to the vaisnavas. After the short talk, devotees were served delicious prasadam and then everybody went to bed early, in anticipation to spend the weekend with other vaisnavas, in order to gain a deep insight of the confidential knowledge of Bhakti yoga as revealed by the Lord Himself. On Saturday, Maharaja led mangala arti as well as Guru Puja for Srila Prabhupada. The kirtan lasted for a long time and devotees danced and sang with full energy. 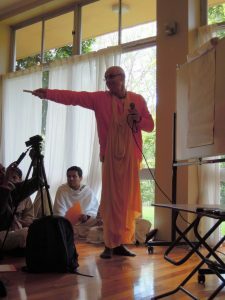 The topic of the first class was about establishing the authority of Srimad Bhagavatam. 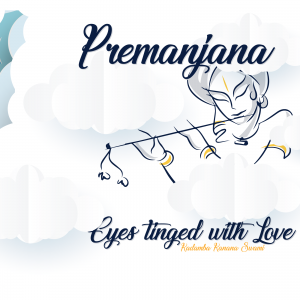 Maharaja began with the explanation of ‘om namo bhagavate vasudevaya,’ whereby ‘om’ includes every aspect of the Lord and ‘bhagavate’, referring to ‘Bhagavan’, indicates that the Supreme Personality of Godhead is the focus of Srimad Bhagavatam. Maharaja explained that the Vedic literature includes many aspects of our life, and that this is the purpose of Srimad Bhagavatam – to give transcendental spiritual knowledge. He told the audience that Bhagavatam is the teaching of Caitanya Mahaprabhu and therefore is highly essential. Maharaja also explained that the first verse of Srimad Bhagavatam establishes the teachings of our movement. In the second class, Maharaja basically spoke about our faith in Srila Prabhupada. The first day ended with the Vrindavan meditation with Maharaja singing sweet bhajans for Their Lordships in Their beautifully decorated altar. On Sunday, after the mangala arti, devotees chanted their japa together in the association of Maharaja. In the first class on Sunday, Maharaja explained faith in context with community that is in relation to people and not entity. He said that vaisnava culture has to be centered around Krishna, and culture should be favourable for cultivation. The main points of discussion were: kanistha-aAdhikari, madhyama-adhikari, and uttama-adhikari. These were explained with reference to the different stages of bhakti from sraddha to prema. The second class on Sunday was focused on developing our relationship in spiritual life, and about the 26 qualities of devotees. Maharaja explained that the depth of the faith directly reflects our relationship with each other. 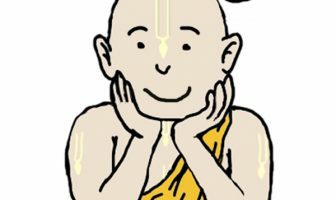 He said that if we make a relationship with the dhama, the vaisnavas, the scriptures and the deities, then our roots will grow and through that our service will go deeper. The final session of the retreat was focused on faith in dialogue, presenting, defending and explaining it. 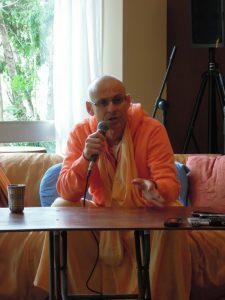 Kadamba Kanana Swami asked for volunteers from the audience and made a panel of speakers to ask them questions about philosophy, culture and real life situations. 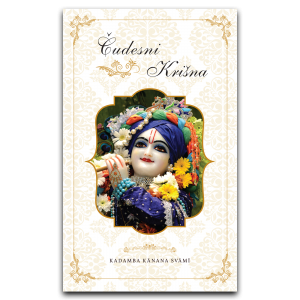 It was emphasised that when our knowledge is realised, and when we experience conclusions of the scriptures, then our faith becomes very strong and eventually, at the stage of bhava, Krsna appears in the meditation. At this stage there is no question of believing or not, but one can actually perceive Krsna. The last part of the retreat was dedicated to discussing Maharaja’s book “Words of a Public Hermit”, and Maharaja distributed this very book as gifts to all the devotees who took part in this retreat! Please also view the pictures and listen to the lectures of this wonderful retreat.